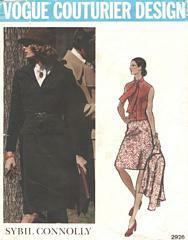 Vintage Vogue Couturier Design jacket, skirt and overblouse pattern by Sybil Connolly. Lined jacket has bias shaped collar, full length sleeves and shoulder pads. Purchased belt holds in slight fullness at waist. Mid-knee length A-line skirt is slightly gathered at front into wide waistband and has two side back zipper closings. Overblouse has bias stock tie neckline and front button closing. Pattern is cut and complete. Envelope has storage wear; small splits on edges.